2014 Topps Chrome Mini Football takes the regular Chrome set, points a Honey, I Shrunk the Kids laser at it and blasts it. Okay, Topps HQ might not have fancy shrinking lasers, but you get the point. The angle 2014 Topps Chrome Mini Football is pretty self-explanatory. It's also fairly straightforward. Besides the expected Refractors, the product delivers one rookie autograph per hobby box. The base set has 220 cards -- 110 veterans and 110 rookies. Rookie cards land one per pack so they're short prints. Like 2014 Topps Chrome, there are also Photo Variations of 25 rookies and 30 veterans. Seeing as how it's Topps Chrome, there are lots of different Refractor parallels: basic Refractors (1:8 packs), Pulsar (1:24), STS Camo (#/99), BCA Pink (#/25), Black (#/15), Gold (#/10), Red (#/5), and Superfractor (1/1). Base cards also have Printing Plates. For many, one of the biggest draws in 2014 Topps Chrome Mini Football is the one-per-box Rookie Autograph. Some have on-card signatures, others use stickers. They all have eight levels of Refractor parallels, none of which are numbered higher than 150. 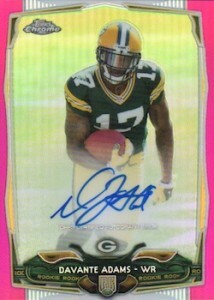 Select cards also have Rookie Autograph Variations done as Refractors. Several basic inserts have also been included in the product. 1985 Topps Football (1:24) brings the classic design over with current players. They can also be found as Refractors (#/50), Pulsar Refractors (#/25), Superfractors (1/1) and Autographs (#/15). 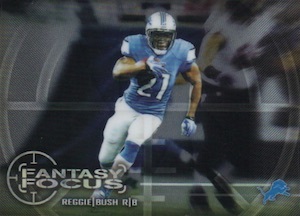 Fantasy Focus (1:12) spotlights fantasy football standouts. These have Refractor (#/50) and Superfractor (1/1) parallels. 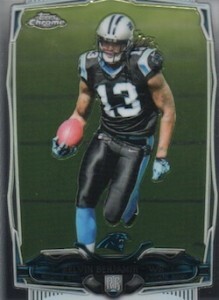 Chrome Rookies Die-Cut (1:24) are easy to identify by their design. While base versions are done with Refractor stock, there are additional parallels: Blue Wave Refractor (#/50), Red Refractor (#/25), Superfractor (1/1) and Autographs (#/15). The toughest inserts to find in 2014 Topp Chrome Mini Football are 1,000 Yard Club and 4,000 Yard Club. Both are inserted one per case. Each set has a similar parallel structure as well: Red Refractor, Blue Wave Refractor (#/25), Superfractor (1/1) and Red Refractor Autograph. SAMMY WATKINS 2014 TOPPS CHROME MINI ROOKIE AUTO AUTOGRAPH REFRACTOR CARD # 75! There is no card #215. 8 cards. 1 per case. 36 cards. Serial numbered #/15. Good: On-card autographs, typical Chrome quality, Refractors. 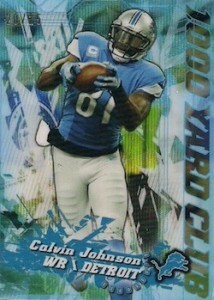 Bad: Nothing new and basically a rehashing of regular Topps Chrome, novelty feel. The Bottom Line: A good product generally offers collectors something specific. 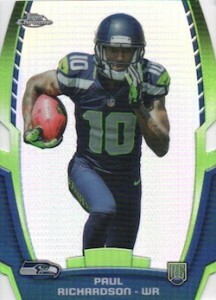 As the name suggests, 2014 Topps Chrome Mini is simply a smaller version of the main Topps Chrome release. If you enjoy Chrome products, this can be a good thing, but it inevitably has the feel of a gimmick. Having said that, the cards look nice and there are some great hits to be found and at a much better rate than the full-sized product. It’s 2014 Topps Chrome, but smaller. The mini cards are 2-1/4” x 3-1/8” and would otherwise be indistinguishable from the regular set. So if you liked the main release, it is very likely this set will appeal to you as well. Not just limited to the actual card sizes, the overall set is smaller and several of the inserts are carried over exactly. 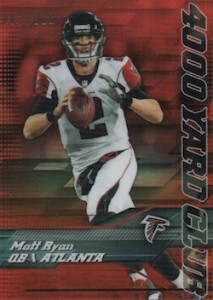 Just like in the regular product, the Chrome Rookie Die-Cuts feature the most appealing design. While the smaller size can cause problems for collectors in protecting and storing the cards, the overall increase in mini products has made mini cases and sheets more accessible that they previously were. Again, there is nothing really new to comment on in regards to the checklist and therein lies the problem. It would have been nice to have seen something new or unique added to this set. Since it is more concise, it is a product that might appeal more to set collectors who are looking for a simple release. With half as many rookie autograph subjects in the base Refractor set versus the main 2014 Topps Chrome set, there was an opportunity for Mini Chrome to bring more quality to the checklist. While the overall list of signers has been tightened up, there are still a few names (cough, Tajh Boyd, cough) that don’t belong in a release that comes this late in the collecting year. With box prices in the $50 to $60 range, most should be able to handle the cost. However, when you realize that the regular 2014 Topps Chrome can be had for $10-15 less per box, it is a tougher purchase to justify. When talking about the potential value for a one-hit box, a lot rides on the single autograph, but there are some big hits to be found and a lot of color. The cards look good, the autograph I pulled was on-card and the insert and Refractor variety is solid, but not excessive. Overall, 2014 Topps Chrome Mini was a fun break. For many collectors, the real question is why. That is a much tougher answer and might cause some to completely bypass the release. 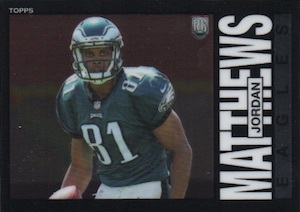 The card gallery of this product shows the rookies with a specific uniform number. Is the picture a “mock up” of the real product or will the rookies have the “00” uniform number, like many of the early offerings have in the past? Brent � These images are mock-ups. Hopefully final cards will have proper jersey numbers by then. When you tilt it, there will be a rainbow finish in the background. If you have a refractor and a base card together, it should be pretty apparent. Most sets also say “Refractor” on the back by the number but I’m not sure if the minis do. why…i dont get this product. why reprint this product in mini form. So the worst product of the year now has a mini version. Really how bad can Topps get? Why not just add the mini of the cards to regular chrome, OH wait they want ALL your money! Brings nothing new to the set except it’s mini. Awesome cards – lots of bling and very good valuable card dispersion. Very fun product to open! This is what normal Chrome should have been! This stuff is LOADED!!! Every other box yields a colored (refractor) autograph. Every box yields a parallel #/102. Almost every box yields a parallel #/99. All the great names are included in the rookie autographs! Would break this again for sure! Also: There are only 1,870 cases made, which is 25% of the normal Chrome’s print run. SP Variation – Odell Beckham, Jr.